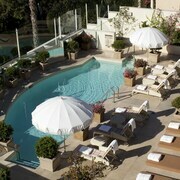 Situated on the Strip, this luxury hotel is within a 15-minute walk of Sunset Strip and Whiskey a Go Go. Melrose Avenue and Beverly Center Shopping Mall are also within 2 mi (3 km). 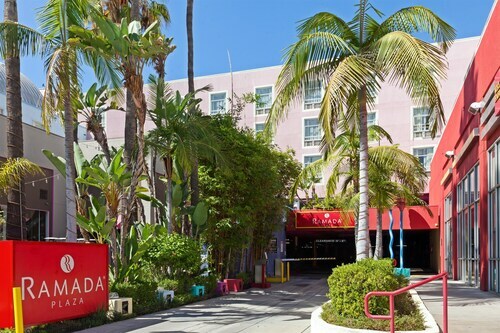 Within six blocks of 100 restaurants, shops, and nightclubs, this Los Angeles hotel is 3 miles from Hollywood, 5 miles from Universal Studios, and 10 miles from downtown Los Angeles. 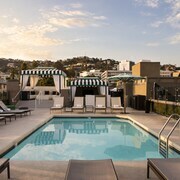 With the Hollywood Hills as the backdrop, Andaz West Hollywood - A Hyatt Hotel is on the Sunset Strip near popular nightclubs and restaurants, a short distance from Beverly Hills and Hollywood. 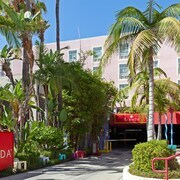 Situated in West Hollywood, this golf hotel is within 2 mi (3 km) of Sunset Strip, Melrose Avenue, and Whiskey a Go Go. Beverly Center Shopping Mall and Cedars-Sinai Medical Center are also within 2 mi (3 km). Tucked away on a residential street, Le Parc Suite Hotel is 1 block from the West Hollywood Design District, lined with over 200 shops, galleries, and showrooms; Sunset Strip is 1 mile north: Rodeo Drive is 1.5 miles southeast. 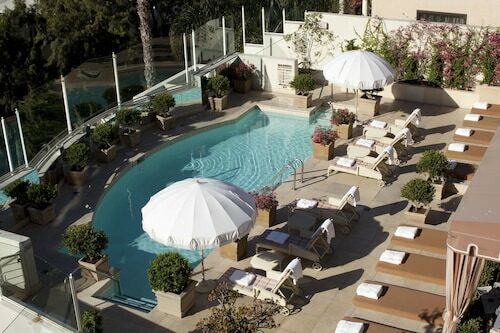 This hotel is also located within 1.5 miles of Beverly Hills and Hollywood. Universal Studios is a short drive away. 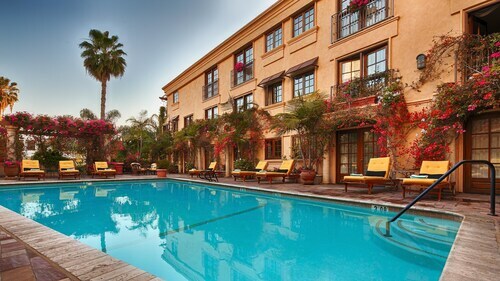 This private, Mediterranean-style, all-suite hotel is on a residential street in West Hollywood, a half-block from the nightclubs of famed Sunset Strip and 1 mile from Beverly Hills. How Much is a Hotel Room in West Hollywood? 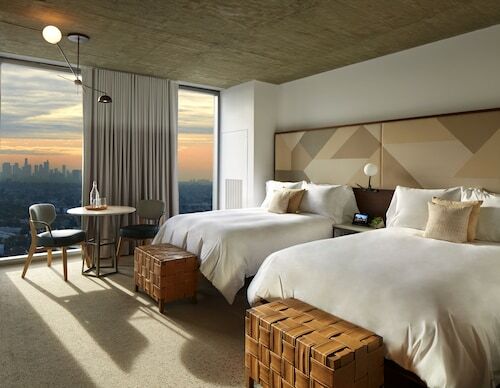 Hotels in West Hollywood start at $219 per night. Prices and availability subject to change. Additional terms may apply. 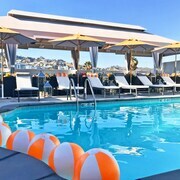 In less than two square miles, West Hollywood packs bronzed hunks and bikini babes into all-day pool parties and fashion-forward hipsters into the hottest southern California nightclubs. If you want to join the in-crowd, shop for trend-setting threads in the city's many fashion boutiques. 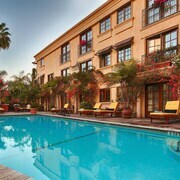 Travelocity can show you the best deals for hotels near shopping in West Hollywood. No need to worry about solid or liquid sustenance to fuel your active visit because the city offers some of the top eateries and bars in California. 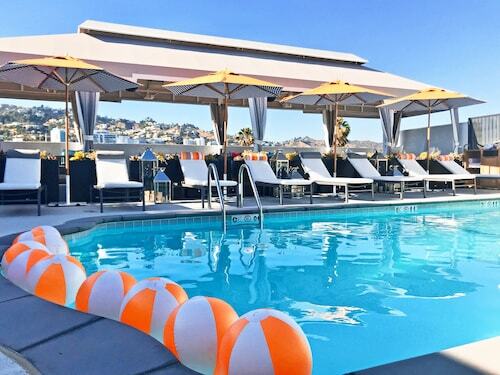 Many of the top hotels in West Hollywood, such as the Mondrian and the Andaz, boast killer rooftop pools complete with bars, cabanas, and views of the surrounding hills. You may even spot a celebrity or two chilling on a lounger. Get your swimsuit or other fashionable attire at the shops on Melrose Boulevard. The famous thoroughfare also contains stores devoted to antiques, gifts, and home goods. When the sun goes down, freshen up at one of the hotels near the Whiskey A Go Go and spend all night at the renowned venue. 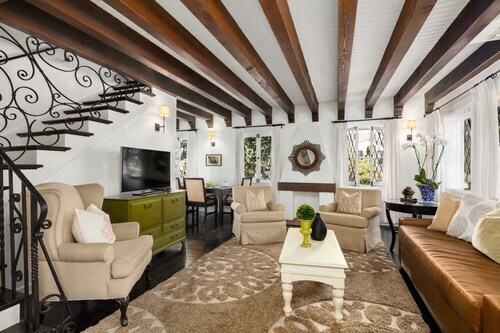 If you plan on visiting during one of the city's wildly popular holiday celebrations, such as the Halloween Carnival, be sure to book your choice of West Hollywood hotels in advance to guarantee space. Whether you prefer bars with go-go dancers, DJs spinning the latest tunes, quiet patios, or crowded dance floors, the city has something to suit your taste. Santa Monica and Sunset Boulevards have many of the happening places. 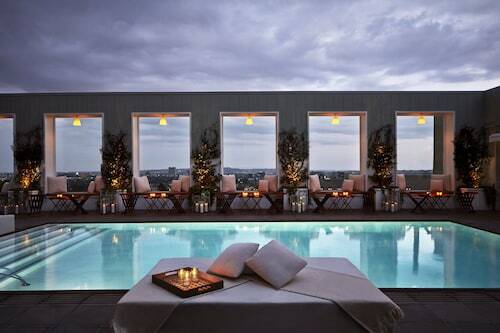 Look for accommodations away from these streets if you want cheap hotels in West Hollywood. Tempting your palate are eateries ranging from affordable diners to high-class restaurants. Indulge in Brazilian specialties like fried yucca, plantains, and coxinha. At Barney's Beanery, you can choose from booths, tables, couches, and stadium seating to enjoy over 700 menu items, including breakfast bagel sandwiches, Irish nachos, BBQ chicken pizza, and baby back ribs. So if you're ready to party hearty in West Hollywood, book with Travelocity now. Our room was not serviced on the last day of our stay. Beautiful property with exceptional charm! I have been here many times, and always enjoy the ambience, decor and location. Unfortunately, The Charlie didn’t remember to record that I had already paid through Travelocity, and they charged me a higher rate for the room (an extra $300 over what I had paid on Travelocity).....I am still working to settle it. Hotel is in a safe area (no gunshots heard). The hotel staff were not very helpful, the printers were out of paper when I tried to print boarding passes. I can only speak English and many of the staff did not. This caused some difficulty when asking for things. 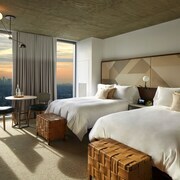 The rooms were clean so overall I’m happy I stayed here as a dirty room is way worse that unhelpful staff. All staff was friendly and very helpful. Bummer to get charged soooo much for parking. Modern Melrose Home With Bentley, Views, Helicopter Ride, Chef, & Jeweler! West Hollywood Penthouse W/ 180 Degree Views + Parking!